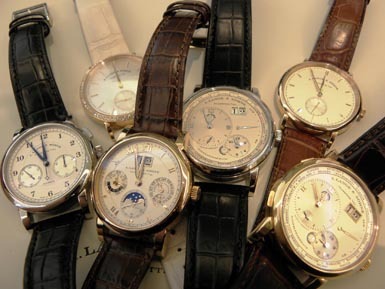 A. Lange & Sohne watches – a collector’s dream. We mentioned this last month, but this watch collectors’ survey is in the final phases. They are still looking for a few more collectors to partake, to round out the 500 collectors who have signed on thus far. The intense survey of luxury timepiece collectors has never been done before. It will give collectors and watch brands insight into the buying habits, decisions and desires of collectors. The watch industry’s leading research company, LGI Network, is administering the survey – and ensures confidentiality. The survey is short and concise and all you need to do – if you buy watches in the $15,000 and up range — is click on the link below, give your email address and they will send you the survey. Then, when the survey results are tallied, you will get a copy of the complete statistics. The results will include unfiltered feedback on brand reputations, purchasing and trade-in practices, pricing, and lots of other information that will provide insights into the leading collecting practices. [update: the survey on http://www.lginetwork.com/collector.html is no longer running] If you took the survey, we’ll report the results soon. Stay tuned. ← Weekend Sojourn: Car season is here … Viper Vs. Corvette ?